The 2c. and 4c./ 1 quart measuring cups are a not just well priced, but are Amazon's best sellers, with over 800, 5 star reviews. You can't go wrong with this trusted product. 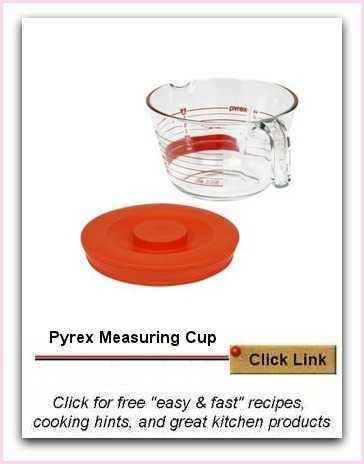 The new formula for Pyrex made in the USA cannot handle rapid temperature changes. Be sure to read the manufacturer's instructions. DO NOT expose the product to rapid temperature change such as adding boiling water or taking it directly from the freezer to the oven. There have been reports of the product spontaneously exploding. I like the this measuring cup because it can go from measuring, then as a mixing bowl, to storage, using the attractive red cover. My own Pyrex items have lasted decades and some of my daily use Pyrex items come from my mother-in-law, so, I suppose these must be over 40 years old! These items last a very long time and are so easy to care for. My attitude to cooking equipment is not to purchase lots but to have just a few quality items that are practical and used frequently. How to choose a measuring cup? While measures come in various sizes, I favor large ones to save time in preparation. There is frankly, nothing worse than measuring using 1 cup measures when you need 3 cups of flour or 6 cups of stock. I don't have the patience! My practice in the kitchen is to work fast to create delicious meals, so I would choose a large measuring cup - at least 4 cups in volume but ideally 8 cup like this item.